I thought I hated Kazuo Ishiguro. I thought I had read something by him at university and loathed it. How very wrong I was. Looking at his list of publications, I don’t actually think I’ve read a single one before. And I loved Nocturnes. I really loved it. I can only imagine that I’ve confused Ishiguro with some other author at university, and have now squandered a good decade of time when I could have read everything he’s ever written, but haven’t. And now I can’t wait to read more of his writing. This book is a subtle delight. Its stories linger with me, and fragments come to mind at odd times – much like half-remembered snippets of a nocturne. The five short stories in this book all involve musicians or music, and people involved in, or fleeing heartbreak. I have hesitated before publishing this post because I think this is a book that you need to sit with, re-read and think about more than once, but the time constraints of this year’s challenge mean a more thoughtful blog may need to wait to 2016. We begin with a crooner serenading his wife from a gondola in Venice, while the guitarist tries to unravel the complicated emotional battlefield he finds himself caught up in. This story has all the serenity of an evening on a gondola, and the calm, sparsity of the telling somehow makes the bittersweetness linger more fiercely. There is also an element of grit to this story which stops it from being schmaltzy. The guitarist has his own sad back-story, and is alienated from this Italian city he is living in. The end of the story also throws up into the air some of the insanity of celebrity and of the different priorities people put on what is important in life. In this story a man returns from teaching abroad to stay with friends, only to discover that he isn’t there for the jolly holiday he supposed. This forms a funnier counter-tune to the story in Crooner, with some real elements of farce – and a useful recipe for creating the smell of a dog in the house, which I will be trying the next time E leaves me unsupervised for long enough. But it still has a sad undercurrent that causes us to reflect on the challenges of maintaining a relationship when we are surrounded by temptation, and when we haven’t necessarily achieved everything we hoped for in life. Probably my least favourite of the five stories, in Malvern Hills we follow a young man who retreats to stay with his sister at her cafe in the Malvern Hills to write music for the summer. Part of the deal is that he has to help her with the cafe, and through this we meet a range of guests including a couple with a very ambiguous relationship who turn out to be musicians. I think I found the young man too objectionable to warm to this story – but appreciate that others may take against him less and find more merit in it! This was a great story about two people who meet when they are stuck in a hotel with their faces bandaged after plastic surgery. We return to the criticism of celebrity that started in Crooner, and here we think about why talent isn’t enough to get you ahead in this world. There is also some of the joy of people’s lives colliding – a bit like when you get stuck in a lift with a group of strangers and you have a strange interlude of getting to know them before you all go your separate ways. It gives you the space to discuss things you wouldn’t normally discuss with people you wouldn’t normally meet. The bit with the turkey was surreal though. In Cellists, we have a young classically trained cellist being taken up and tutored by a more experienced woman who promises to take his playing to new heights. As the story unfolds, her backstory raises questions about the value we place upon expertise and taste in music. These stories interlink with each other, and bounce over similar themes, but from different perspectives. They are also usually told from the perspective of someone outside of the unhappy couple. which, at least, stops them from being too mawkish or miserable. Together they combine to force you to stop and think. It is a slim volume that packs a punch. 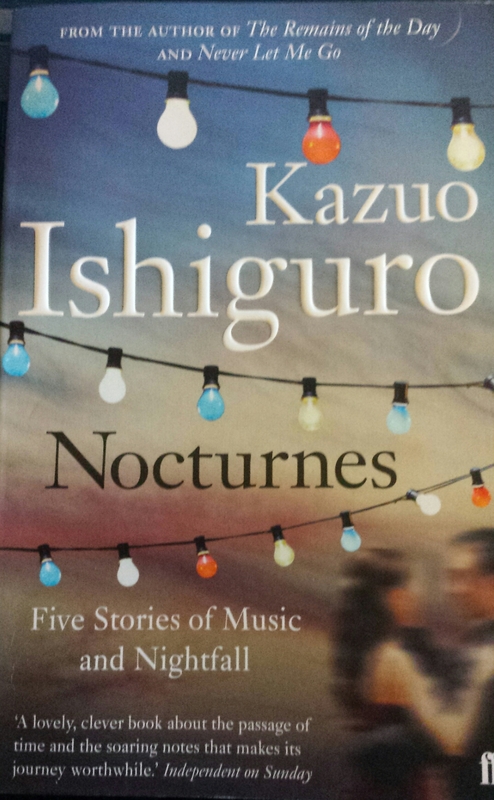 Tags: books, Fiction, Kazuo Ishiguro, love, music, Nocturnes. Bookmark the permalink. I’ll add this one to my list. Ishiguro is one of my favourite writers, so it may have been me that tried to make you read Ishiguro’s ‘The Unconsoled’ at university … it is a weird dream-like book and not really representative of the rest of his work. So I apologise if that turned you off! (I still think it has the merit that you need only read a few pages to find out if you like it, since the style never changes). Meanwhile the rest of his stuff is absolutely fantastic and far more accessible. A brilliant writer. And after TEN YEARS (!) he has a new book coming out in 2015! I can’t wait. It’s possible Richard. It could just have been a great book that I read at the wrong time. The main thing is that now I have rediscovered him!